Should the Oscars go back to having only 5 Best Picture nominees? Sean O’Neal: In 2009, the Academy announced that it would expand the list of Best Picture contenders to 10, a move that its then-president Sid Ganis characterized as a throwback to the crowded nominees of the 1930s and 1940s, as well as a bold step toward a future of recognizing a broader scope of movies. The decision, Ganis said, would “make it more interesting and less cloistered”—a subtle reference to the growing exhaustion with the category’s refusal to consider more popular fare, which had fueled many an op-ed during the previous year’s snubs of The Dark Knight and WALL-E. It was time for the Oscars to start reflecting the movies people actually go to see, and Ganis speculated that opening up the borders might allow for documentaries, foreign-language films, animated films—“maybe even a comedy.” Loosening up would probably also increase the chances of people actually tuning in, he reasoned, given that they only seemed interested when Titanic or The Lord Of The Rings was up for something. All in all, widening seemed like a win-win for everyone, except maybe the critics who now had to generate twice the number of think-pieces. And it worked… for a little while. 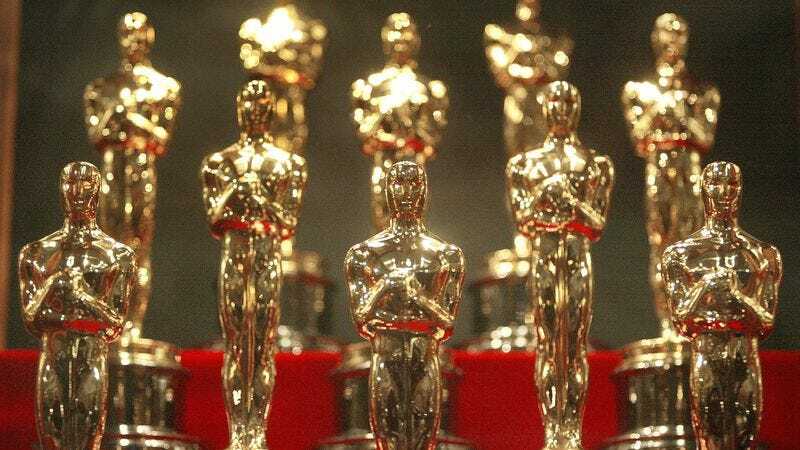 The 2009 Oscars actually did include a few nods to the hoi polloi, letting Avatar, Up, and District 9 behind the velvet rope with more traditional contenders like The Hurt Locker and A Serious Man. The following year’s nominations for Inception and Toy Story 3 kept that populist spirit alive—but as it turns out, increasing the number of slots neither opened the door to more blockbuster fare (instead it mostly allowed for smaller indies like Winter’s Bone), nor did it bump the ratings. In fact, Oscars ratings actually declined, and while you could probably blame this on other factors—general awards show fatigue, James Franco and Anne Hathaway hosting—the Academy quickly amended its position in 2011, changing to a more loosely defined number of “somewhere between five and 10” nominees, depending on how many it felt had truly earned the distinction of “extraordinary merit.” Since then, it’s stuck to just eight or (as with this year) nine, always leaving that 10th slot open as a dangling sick burn to the 1,000 other movies that somehow aren’t worthy to fill its empty seat. But aside from the occasional bone tossed to crowd-pleasing fare like Mad Max: Fury Road and Django Unchained, today the Best Picture slate still looks a lot like it used to: self-consciously “prestige” dramas, modest art-house sleepers, self-aggrandizing odes to Hollywood, big, thundering horrors-of-war movies, frame after frame of people crying. Within that roster, you can almost automatically filter out the films that will eventually sift to the middle and be all but forgotten. La La Land and Arrival seem destined to be talked about 20 to 30 years from now (if not, perhaps, for uniformly positive reasons), but it’s hard to imagine history having the same regard for, say, Fences and Lion. Rather than encouraging a more colorful—and representative—variety of the year in film, the bloated Best Picture category just seems to be opening the door for more of these good, but not timelessly exceptional, films to slip through—which only muddies the distinction for those that actually deserve it. And as much as it might hurt to lose some of those nominees, ultimately it might benefit everyone to get back to the more curatorial, agonized-over short-lists of the past. Especially if you’re not throwing in, to name one dark horse, Deadpool just to shake things up. Alex, as someone who has to think about all these films far more than most, what do you think of the Academy’s approach to picking Best Picture nominees? Are there any real advantages to keeping it open to 10, even if the Academy hardly ever seems willing to take them? And why do you think they’re still so reluctant to actually use those extra slots on more popular, less obviously “Oscar” films? Alex Dowd: Sean, I think you’ve grazed something crucial here, and it’s that simply increasing the quantity of Best Picture nominees isn’t automatically going to improve the quality (or eclecticism) of them. Oscars are gonna Oscar. You can hand Academy members one to five more Best Picture slots, but as the last eight years have shown, you can’t stop them from filling those slots with just more of the prestige pap they’ve always gravitated toward—the noble white-elephant art that’s been a cornerstone of Oscar night since the very start. It’s amusing to me that the organization’s rule-makers had to tweak the 10-film nomination system just two years after they introduced it, because a middlebrow embarrassment like The Blind Side could suddenly compete for the big prize. The new rules, which specify that a movie must appear at No. 1 on a certain percentage of the ballots to score a Best Picture nod, have probably blocked some unworthy contenders. But they haven’t stopped the Academy from choosing, say, two mediocre Brit-genius biopics over, say, Inherent Vice or even a delirious crowd-pleaser like Gone Girl. As far as blockbusters go, the exclusion of that Gillian Flynn adaptation strikes me as one of the more egregious snubs of the last few years: It was a box-office smash from an A-list director that earned great reviews. What more could voters want? More broadly speaking, though, I don’t see some aggressive conspiracy against populist fare at play here. You asked why the Academy remains reluctant to nominate big popcorn movies. I think the truth is that we’re not exactly living in a golden age of big-budget mainstream moviemaking. When a film manages to both capture the imagination of audiences and earn raves from the critical community, it usually does get nominated; can you imagine a big-screen demolition derby like Mad Max: Fury Road making the more curatorial five-film cut? The truth is that a movie like Deadpool doesn’t need a Best Picture nomination. Its bags upon bags of money are reward enough. Beyond validating the tastes of those who helped make it such an enormous hit, what would including it in the lineup accomplish? One could certainly make the case that the Best Picture nominees should be movies that struck a chord with audiences or captured the zeitgeist. But if awards for art have any intrinsic value, it’s their ability to put neglected works—the movies that don’t gross $300-plus million—on people’s radar. To that end, if there is an advantage to keeping the lineup above the historical five, it’s not in acknowledging the biggest annual hits but in giving a boost to smaller fare. You mentioned Winter’s Bone, which I think is a perfect example of a movie that would never really have a shot in the abbreviated-slate days, but certainly deserves the wider audience a Best Picture nomination might facilitate. (As you’ll remember, it was The A.V. Club’s favorite movie of its respective year.) I was also very happy to see Amour slip into the lineup a few years ago; beyond an accompanying nomination for director Michael Haneke, there’s no real reason to think that a movie so rewardingly punishing ever would have earned a seat at the big table if the Academy hadn’t added more chairs. I’d love to see them go further, and maybe eventually usher a documentary into the fold. Isn’t that massive O.J. doc a more worthy contender than a quippy superhero movie? It’s possible the Academy will take greater advantage of the expanded slate in the years to come; last year, in response to the #OscarsSoWhite controversy, the organization added a large bloc of new and more diverse voices—including some serious auteurs whose taste might skew the collective one a little left of center. Still, I can’t help but think that old habits will die hard for the Academy, and that we’ll keep seeing forgettably “respectable” films clinging to the outer edges of Best Picture. This year, more than any since the Academy upped the count, feels like a case for reverting back to the old, five-film system: A lineup that was just Manchester By The Sea, Moonlight, Hell Or High Water, Arrival, and La La Land would be one for the ages. Sean, do you think restoring the abbreviated lineup would also the restore the significance of the award, making a Best Picture nomination actually count again? Or am I ascribing more meaning to the award than it deserves? Sean: I think just by dint of our jobs, we ascribe far more meaning to the Oscars than most people would say they deserve. That said, I agree with you that having a more tightly curated list would make it a far more exciting race—even at the risk of leaving out some of the smaller, deserving fare (which would ideally still be represented across the vast and endless sphere of awards shows currently jostling for attention)—and return an aura of being truly exceptional to that final, mercilessly selected five. Not to get all “everyone gets a trophy these days” about it, but in the effort to include everything that was “really good” as opposed to truly excellent, the category has become diluted in a way that serves neither nominees nor viewers—just the studios who enjoy the demonstrable benefits of an Oscars bump. Which, not for nothing, often feels like the reason some films are nominated over the established hits that, as you say, don’t really need it. Just to clarify, I’m not necessarily angling for more popcorn movies to be included, and definitely not Deadpool specifically (a movie I thought was really good, as opposed to truly excellent). My point was just that having this broader slate ostensibly gives the Academy a chance to make Best Picture a more representative capsule of the year in film, and year after year, it’s mostly squandered it. Tossing in the biggest hits automatically doesn’t make sense—this isn’t the MTV Movie Awards, and besides, those blockbusters are usually given the consolation prize of technical nods anyway. But there’s a real missed opportunity to step outside the bounds of critical consensus and acknowledge the films people will actually be talking about a decade from now, thus combating the charges of “elitism” the change was meant to address in the first place. They already know they’re not going to give it to them, so why not choose Bridesmaids, a movie that immediately spawned its own veritable micro-genre of imitators, over War Horse, a film I’m not even sure Steven Spielberg remembers making? That’s what expanding the category was supposed to do. And while I definitely think it’s important that more diverse voices, more obscure films, and more difficult auteurs are represented through this expanded scope, I also think the continued marginalization of whole genres is a serious problem that it has yet to—and definitely should—address. Never mind quippy superhero movies; what about comedies, period? From its very beginnings, the Academy has turned its nose up at comedy, last giving the Best Picture prize to Annie Hall in 1978. Since then, it’s only allowed a handful of comedies to even compete, and these are typically of the muted, laugh-quiet-riot variety practiced by Jason Reitman, David O. Russell, and, yep, Woody Allen. The same could be said of horror films: It’s been 25 years since The Silence Of The Lambs won Best Picture—and depending on where you think Black Swan belongs, a horror movie hasn’t been nominated since 1999’s The Sixth Sense. Granted, maybe you also feel we’re not exactly living in a golden age of horror. But still, how much more excited would you (and everyone else) be if Green Room—our pick for third-best film of the year—were here to shake things up a little, and push the boundaries of what we deem to be “exceptional” cinema? If the Academy’s not going to do that—and if it continues to overlook its chance to commemorate all the myriad documentaries, comedies, horror films, action films, etc. that make going to the movies such an unpredictable pleasure year after year—then it may as well just go back to that tight five. At least then it would restore some much-needed tension to a race that always feels more or less decided by the end of the calendar year, and it would keep those many exclusions from feeling like the Academy is simply too snobby to accept that anything besides dramas about deeply unhappy people deserve serious consideration. On a far more bluntly practical note, wouldn’t you—a person who’s professionally charged with doing the bulk of that serious consideration—welcome the relief of only having five movies to debate endlessly, rather than a bloated eight to 10? Practically speaking, do you think this also ends up being a burden on the regular movie fans who attempt to cram in all the Best Picture nominees out of a sense of obligation—who maybe wouldn’t bother seeing Lion if they didn’t feel like they had to? Alex: Absolutely, on both counts. Ballooning the slate of Best Picture nominees to eight or nine has made the category unmanageable for a lot of people, critics marginally included. As someone who makes his living writing about movies, I can’t really complain about the annual catch-up scramble that results from discovering that, wait, really, they nominated Philomena? (If nothing else, this year’s nominations forced me to see and form an opinion on Lion. Hooray?) But it is harder to take a broad view of the category—to identify what this exact collection of nominees says about the year in movies—when it ends up just looking like a grab bag of Stuff Some People Liked throughout the year. Some very strong essays once emerged from the random corralling of five movies under the Oscar’s highest banner. These days, it’s next to impossible to tease out any real relationship between the nominees, beyond the money their respective studios spent on for-your-consideration campaigns. But that’s a #CriticProblem. I’m more interested in what the category bloat has done to the casual moviegoer’s relationship to Best Picture as a kind of trusted, curated to-see list. I used to watch the Oscars with my dad every year—he got me hooked on the silly guessing game of this annual spectacle when we sat down to watch Forrest Gump neatly hand Pulp Fiction its buttocks. For my father, part of the fun of the Oscars was seeing every nominee before the ceremony—to find out what all the fuss is about, to form his own opinion, to have a rooting interest at night’s end. But since they doubled (or nearly doubled) the number of movies in contention, he doesn’t really try to see them all anymore. Unlike his kid, he’s not paid to keep current on this stuff. What once looked at least superficially like a seal of quality—these are the five movies you need to see—now looks like a cupboard full of participation trophies. In a way, including more movies has actually resulted in my dad seeing less of them. I doubt he’s the only one.